← Which fictional character are YOU? I put in 3 miles yesterday and the ankle felt perfectly normal. YAY! I am not going to push it too hard too fast, though. I woke up at 4am this morning to get my feet on the street, but the second I heard the weather outside, I knew I was going back to bed! It was raining like mad out there, but even worse were the gusts of wind howling around the house. I looked it up later, we were having wind gusts 20-28mph around that time here! Yowza! Last night I took another listen to Desert Island Discs. For those of you not familiar with it, it is a radio programme on BBC Radio 4. The interviewee picks a track from the 8 records they would want to have with them on a desert island, along with 1 book (the Bible & the Complete Works of Shakespeare are already “included”) and 1 luxury item. It’s an interesting program interspersed with a more intimate interview than what you might normally hear. I’ve really enjoyed the couple that I’ve heard so far – Sir Michael Caine & David Tennant (of course!). So it got me to thinking… what would be MY selections? The Tibetan Book of the Dead would absolutely be the book I would take with me. My father gave me a copy a year ago – which was rather funny because I had given him a copy of it in audiobook format at the same time! :) I would read this book any time and will read it over & over in my lifetime, each time learning something new & feeling inspired by something different. Borrowing from David Tennant’s page – I too would like to have a solar powered DVD/TV system, except mine would include every episode of Doctor Who, of course! Xanadu by Rush from A Farewell To Kings – the first Rush song I ever heard. I was instantly hooked by the amazing lyrics! Every time I hear this song, I’m transported back to high school, hearing it in my friend Scott’s car as we left Country Kitchen from our usual hours long conversation over coffee. Wicked Game by Chris Isaak from Heart Shaped World – I love listening to Chris Isaak. I just love his style and his voice. Enjoy the Silence by Depeche Mode from Violator – I used to sing this song to the manlets when they were babies. This CD was one that I could never hear enough! Whole Wide World by The Proclaimers from Life With You – picking which CD from this duo was the hardest part! I love all of them and I almost went with Sunshine on Leith. But I loved this song so much already & when they did it, I was over the moon! Henrietta by The Fratellis from Costello Music – a new favorite of mine, actually! I love to run to this song, it gets my feet moving every time it comes on the iPod! Symphony No. 9 by Beethoven – but I’d want the box set of all of them! I have always loved Beethoven above all other classical composers. Quite Ugly One Morning by Christopher Brookmyre – my one choice for a spoken word CD to listen to. First, because this book utterly sucked me in from the very first scene. it’s an amazing story, with many laughs along the way – I never would have thought that such a vivid & grotesque description of a grisly murder scene would make me laugh, but this one takes the prize for it. Not to mention it’s read by my favorite guy in his native Scottish accent. This audiobook would keep my happy for quite some time. No clips to be found anywhere, but if you follow the link, you can listen to a sample via the Audible site. 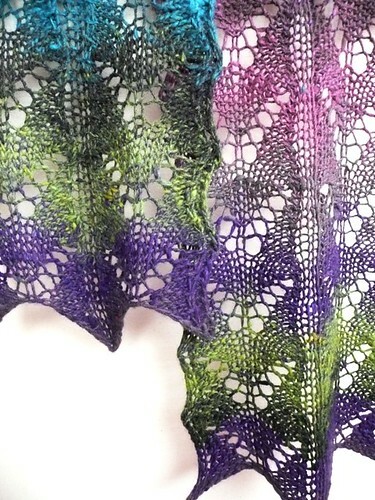 Well I’m still on hold for the manlet’s hoodie – I couldn’t get the yarn to take the color vividly enough, so I place an order from Knit Picks for some of their bare superwash worsted. 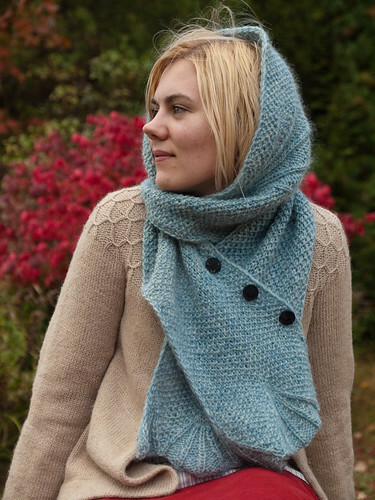 When it arrives, I’ll be dyeing that in the colors that I know he wants & I’ll be able to make progress on it! In the meantime, I’m still working on little projects to fill an advent calendar for my sister as well as the Lucius Malfoy socks. Time to get back to finishing those patterns that are perculating in the back of my brain already! On the subject of my patterns… I must say, I am SO thrilled with the response of all the folks on Ravelry to the ‘Help for Haiti’ tag!! In just over a week, I’ve already collected $160.00 to donate to Doctors Without Borders! You all are just amazing! As always, these are not my patterns! 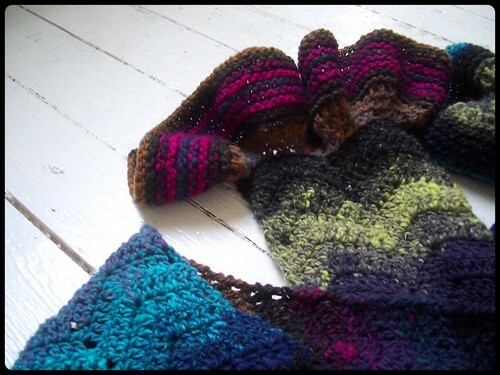 Please click the picture to go right to the Ravelry pattern page for more info! 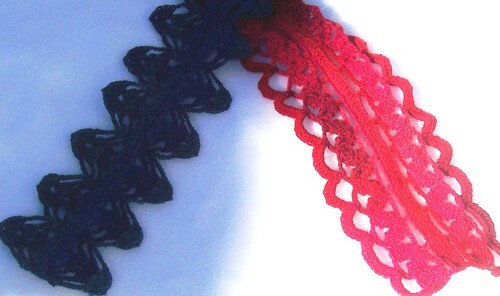 I just love lace! This is so pretty! 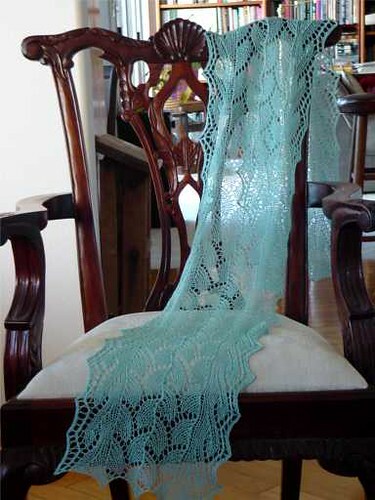 * Another lovely lace scarf! 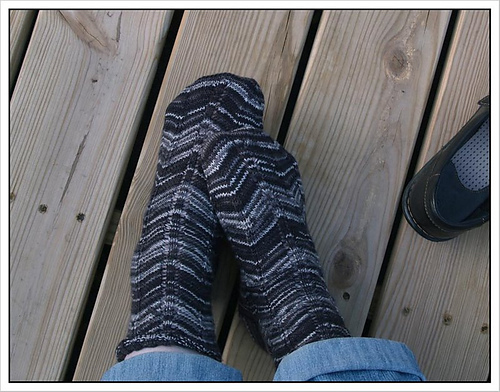 * What a cute pattern for some self-striping sock yarn! * Such a nice little tank! I love it! * Wow! That is one heck of a scarf! Cute! I really like this mesh tunic, lovely! 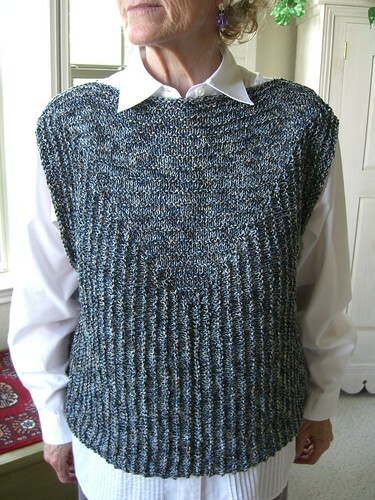 This entry was posted in Running and tagged Desert Island, Free Patterns, Knitting, Running, Today's Ravelry Search. Bookmark the permalink. My 12 yo was scandalized when she over-heard me singing along with Chris Isaak! Evidently I’m too old and shouldn’t be able to remember the words to songs from my teen years. great mix of music- I was laughing out loud at the weekend hearing my 12 yo bealting out Journey’s “don’t stop believing”…. oops that was the music on the tape that D made for me when we first met! do kids make compilations for each other now? haha! i used to sing “enjoy the silence” to my #2 son when he was a baby, too!